Lobatse, Botswana – In Botswana, cattle is a way of life. Owning and herding cattle and selling animals for quick cash when money is tight provide the livelihood for much of the rural population and represent an important supplementary income for city dwellers. When in 2008 the European Union (EU) tightened sanitary requirements on beef imports, Botswana’s second largest export industry came to the verge of losing its most important and lucrative market: it had neither the equipment nor the know-how to perform the tests required. Since then, the use of nuclear and nuclear-derived techniques, introduced with support from the IAEA in collaboration with the Food and Agriculture Organization of the United Nations (FAO), has enabled the country to put in place veterinary and food safety surveillance systems that meet EU requirements and have successfully passed inspections. Beef is the largest non-mineral export commodity of the country, accounting for 3.3% of total exports. In contrast to minerals such as diamond and nickel, the export performance of beef has a direct impact on the livelihood of a large segment of the population, many of whom are small-scale farmers. Botswana has 3 million cattle and 1.6 million goats for its 2 million people. A suspension of Botswana’s beef exports to the EU could hurt the country significantly. In 2011, Botswana suspended beef exports to the EU for a short period of six months at an estimated €48 million in lost revenues. The focus of successive IAEA technical cooperation projects has been to build local capacity in analysis covering an increasingly wider scope of diseases, veterinary drug residues and other contaminants. By the end of this year, the Botswana National Veterinary Laboratory (BNVL) will be able to carry out all of the required tests in-house, and sending samples for lengthy and costly testing in Europe will no longer be necessary, said Chandapiwa Marobela-Raborokgwe, head of BNVL. The lab can now perform tests for 13 different substances. This will reduce costs by over half and lower test turnaround time from around nine months to less than a month. Securing a market where we can derive better prices for our products is of great importance. The capacity building we receive from the IAEA strengthens our ability and empowers us to deliver for our population. Though the country is free from the most dangerous animal diseases, it continuously faces the threat of transboundary animal diseases re-entering from neighbouring countries. Foot and mouth disease is present in the north of the country and could spread to cattle herding areas in the south, which are free of the disease. Conventional disease diagnostic methods are not sensitive or fast enough to provide timely and reliable results, delaying detection and response to outbreaks, said Farayi Chigwada, the chief veterinarian in Mochudi, 40 kilometers north of the capital Gaborone. “By the time you got the results back, the animal has either died or recovered,” he said. In 1995, the authorities ordered the slaughter of 300 000 cattle to stop the spread of contagious bovine pleuropneumonia (CBPP), a cattle lung disease that entered from Namibia. The IAEA, in partnership with FAO, supported BNVL in strengthening its diagnostic capacity by training its staff and introducing modern techniques such as nucleic acid amplification tests and isotopic methods that can detect pathogens in a very early stage of the disease (see Nuclear and nuclear-related techniques used for testing animal diseases and food contaminants). Through its technical cooperation projects, the IAEA supplied equipment and reagents to strengthen diagnostic and surveillance capacities. In 2014, authorities managed to quickly stop a local outbreak of Newcastle disease thanks to the veterinary surveillance techniques put in place with the help of the IAEA. “A lot fewer chickens died thanks to rapid diagnosis and early detection,” Marobela-Raborokgwe said. BNVL has received recognition as a World Organization for Animal Health (OIE)’s reference lab for CBPP. “We have been able to move from zero capacity just a few years ago to becoming one of only four reference labs in the world,” Marobela-Raborokgwe said, adding that her colleagues are now assisting Angola, Namibia and Zambia in their eradication efforts. BNVL performs tests for neighbouring countries, while at the same time helps them to build capacity, assisting the region to meet its 2030 target date for complete CPBB eradication. In the meantime, BNVL is receiving support from the IAEA and the FAO in extending testing capabilities to other diseases, including African swine fever and lumpy skin disease, which affects cattle across much of Africa. With the support of the Ministry of Agriculture, it is also working on opening up laboratories across the country, bringing diagnostic services closer to farmers, further reducing testing time. Controlling for food contaminants is equally important. Farmers use vaccines and veterinary drugs to control animal diseases. They also use pesticides to control weeds in fields whose crops are fed to livestock. Residues of the chemicals may remain in the meat and enter the human food chain – hence the importance of food safety surveillance. 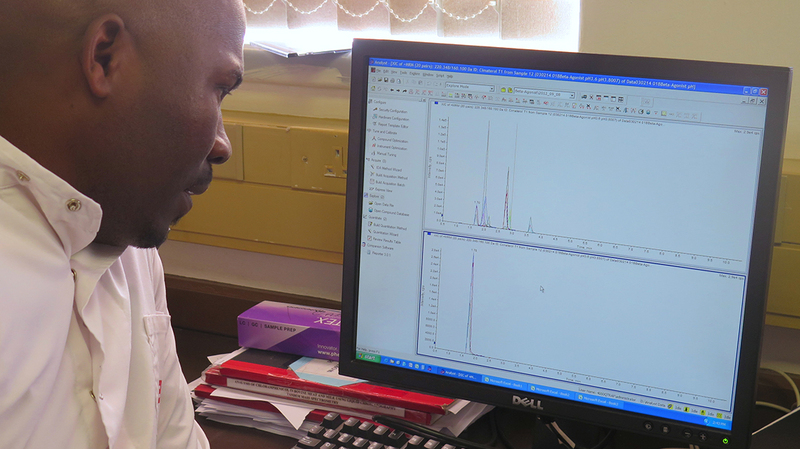 The IAEA has helped BNVL develop its capacities to analyse residues from pesticides and veterinary drugs as well as other toxins by utilizing isotopic and nuclear-related techniques. This project, and how it can be further deployed or replicated elsewhere will be discussed at this year’s Scientific Forum on 28-29 September in Vienna, which focuses on the contribution of nuclear science and technology towards the achievement of the United Nations' Sustainable Development Goals. Radio receptor assay: These are easy-to-perform and accurate tests that analyse up to seven groups of veterinary antibiotics, mycotoxins and pesticides. In this test, binding agents, such as bacteria that selectively bind to the contaminants, are added to the sample, along with a version of the contaminant marked with a radioactive tracer. These include a radioactive isotope, typically tritium (3H) or carbon-14 (14C). If the sample is contaminated, the contaminant in the food sample is competing with the marked contaminant, so less of the latter is bound. If the sample contains no drug residues or other contaminants, the agent binds exclusively with the tracer-marked additive. This difference can be measured and the amount of contaminant, if any, identified. Liquid chromatography with mass spectrometry: This analytical “finger printing” technique is used to detect and identify very low concentration levels of chemicals, in this case food contaminants, and distinguish them from other material. High performance liquid chromatography (HPLC) is used to separate, identify and quantify each component in a mixture. The different components of the mixture react differently with the material in the chromatography tool, which provides the basis for the distinction. The mass spectrometer, at the same time, identifies chemicals based on their molecular masses. While the two tools combined provide a more precise measurement than each one would do individually, the addition of stable isotopes as reference material improves the reliability of the technique. Polymerase chain reaction (PCR): This technique is used to replicate, or amplify, a specific region of DNA billion-fold in just a few hours. The detection of the amplification of the target DNA is then monitored by either radio-isotopes or by fluorescent molecules. PCR is the most sensitive method to detect microbial pathogens in clinical specimens. It is also very specific, as it usually targets a specific marker on a given pathogen. PCR consists of repeated heating and cooling, causing separation of the two DNA-strands and then replication of the original DNA. This procedure gets repeated until enough copies of the targeted molecule are available. Scientists can then identify the presence of the pathogen’s genome. Real time PCR (qPCR): This is technique is a variant of PCR, where the PCR reaction can be analysed as the amplification takes place. The advantage over standard PCR is that real time PCR is ‘live’ and less prone to handling contamination and is therefore the preferred approach.